Is there a better alternative to Audio Book Transformer? Is Audio Book Transformer really the best app in MP3 category? 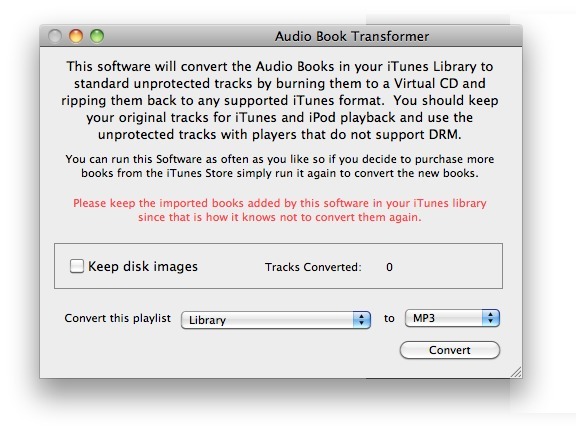 Will Audio Book Transformer work good on macOS 10.13.4? Audio Book Transformer takes the drudgery out of converting your iTunes audiobooks to MP3 so you can listen in the car, or on any device that doesn't support the audiobook format. Use it to convert from iTunes audiobook to MP3, AAC, Apple Lossless, AIFF, or WAV - whichever format your device will play. Now you can listen to your audiobooks while you drive! It works with either a CD-RW or any virtual CD-drive software, and doesn't change your original audiobook files. Audio Book Transformer needs a review. Be the first to review this app and get the discussion started! Audio Book Transformer needs a rating. Be the first to rate this app and get the discussion started!